The Wildcats are 3-9 straight up in their short bowl history but have been potent as an underdog under Pat Fitzgerald, going 6-1-1 ATS in its last eight games as a dog. The Wildcats will have another shot to continue the betting trend in QB Clayton Thorson's final game, the Holiday Bowl on Monday against Utah. 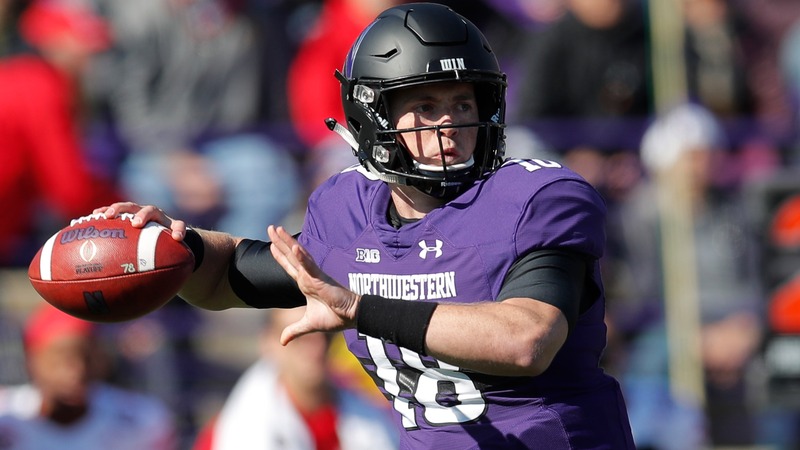 The Northwestern Wildcats are 4-10 straight up in their short bowl history but have been potent as an underdog under Pat Fitzgerald, going 6-1-1 ATS in its last eight games as a dog. The Wildcats will have another shot to continue the betting trend in QB Clayton Thorson's final game, the Holiday Bowl on Monday against Utah as 7-point underdogs. Thorson, already the program’s all-time winningest quarterback at 35-17, needs 91 passing yards to break Brett Basanez’s school record of 10,580. The Wildcats didn't get off to a great start this season after Thorson tore his ACL in last year's Music City Bowl, going 1-3 SU/2-2 ATS through the first four games, including a bad loss to Akron. But the Purple Cats used their tough run defense to help win seven of their final eight games to reach the Big Ten title. Ohio State overpowered the Cats late but Thorson kept them within seven points mid-way through the fourth quarter until the Buckeyes pulled away for the win and cover. __MORE:__ [New Year's Eve college football bowls betting lines, trends, picks](https://www.betchicago.com/new-years-eve-college-football-bowls-betting-lines-trends-picks-public) Northwestern will lean on a defense that ranks 32nd nationally per S&P+ and is 11th-best in rush efficiency and 13th-best in first-and-goal success rate. It will be without senior linebacker Nate Hall (shoulder) and senior defensive tackle Jordan Thompson (knee), however. Utah is also banged up and will be without running back Zack Moss (knee) and receiver Britain Covey (knee). Quarterback Tyler Huntley is a game-time decision after missing the last four games with a broken collarbone and Pac-12 tackles-for-loss leader Chase Hansen (undisclosed) is also questionable. Northwestern finished the regular season with a negative yards per play differential and will be hard-pressed to find success a Utes defense that ranks fourth nationally against the rush, 24th against the pass and owns the best red-zone defense. # 2018 college football bowl game odds ## Holiday Bowl betting lines, odds and prediction Monday, Dec. 31 at 6 p.m. CT on FS1 from San Diego ### Northwestern vs. Utah odds __Point spread:__ Utah -7 __Total:__ 46 __Betting line movement and games notes:__ Utah opened as a 6.5-point favorite at respected offshore sportsbook BookMaker before reaching 8 points early in the month. With injury statuses become more clear, the line dropped to 6.5 and then back to 7 as of Sunday's writing. The total has increased from 45 to 46 in Las Vegas. __S&P+ prediction:__ Utah 32, Northwestern 17 __Note:__ S&P+ rankings are an advanced data set of tempo- and opponent-adjusted components of the five factors of college football: Efficiency, explosiveness, field position and finishing drives. Per creator Bill Connelly, a fifth factor, turnovers, is informed marginally by sack rates. __Play and win:__ [Join our free contests](https://betchicago.chalkline.com/) ## Northwestern football betting records, stats 2018 SU record: 8-5 2018 ATS record: 6-5-2 2018 O/U record: 6-7 S&P+ rank: 80 Off. S&P+ rank: 103 Def. S&P+ rank: 32 Special Teams S&P+ rank: 122 __MORE:__ [College Football Playoff Odds Shopping](https://www.betchicago.com/odds-shopping-college-football-playoff-alabama-clemson) ## Utah football betting records, stats 2018 SU record: 9-4 2018 ATS record: 7-6 2018 O/U record: 7-6 S&P+ rank: 17 Off. S&P+ rank: 43 Def. S&P+ rank: 22 Special Teams S&P+ rank: 7 ## Northwestern vs. Utah Holiday Bowl betting trends Utah is 14-1 straight up and 11-4 ATS in its last 15 bowl games. Over the past five seasons they’re 5-0 SU and 4-1 ATS in bowls. Utes are 10-4-1 ATS vs. a team with a winning record. Wildcats are 19-7-1 ATS in their last 27 games as an underdog. Wildcats are 13-6-2 ATS in their last 21 games overall. UNDER is 23-8-1 in Wildcats' last 32 non-conference games.